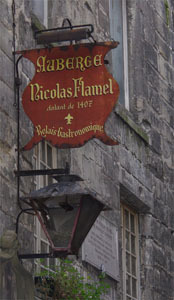 Book your parking space to have a lunch or dinner in the house of Nicolas Flamel, the oldest house in Paris ! Come spend a day or an evening in historical Paris, admire the front of the Maison de Nicolas Flamel classified as a historical monument and eat at the Auberge Nicolas Flamel. To do so, we advise you to book your parking space in advance to avoid parking difficulties in such a busy district. The Beaubourg Centre Pompidou car park is located 5 minutes on foot from the Maison de Nicolas Flamel. This car park proposes reduced priced parking passes specially for lunch and dinner at the Auberge Nicolas Flamel and sold exclusively on the ParkingsdeParis.com website.